WWE TLC 2018 Highlights: A number of titles will be on the line, including the coveted WWE Championship and other titles including the Smackdown Women’s Championship, intercontinental championship and tag-team titles. WWE TLC 2018 Highlights: The stage is set for the final pay-per-view of the year from WWE. TLC: Tables, Ladders and Chairs. It is being held in San Jose, California in the USA. It will feature 12 matches, several of these to be fought using the aforementioned equipment. A number of titles will be on the line, including the coveted WWE Championship and other titles including the Smackdown Women’s Championship, intercontinental championship and tag-team titles. Most of the eyes will be on the biggies: AJ Styles vs Daniel Bryan for the WWE Championship, Nia Jax vs Ronda Rousey for WWE RAW Women’s Championship match, Dean Ambrose vs Seth Rollins for WWE Intercontinental Championship match. Ronda Rousey walks out to the ring and sends Lynch and Flair flying outside the ring! Asuka climbs the ladder and wins the SmackDown Women's Championship. What a remarkable TLC match. Broken hearts, broken bodies but history made once again. Tonight the Empress of Tomorrow takes the throne! Becky Lynch sets up the ladder outside the ring. She goes on top of it and in a reminiscence of Evolution Lynch flies through the air and into the Commentarotrs table where Charlotte Flair was lying. Lynch's bodyweight went right through flair's ribs. Utter Mayhem around the ring! Dean Ambrose puts Rollins in a submission to wear him down. He then hits a swinging neck breaker but cannot get the count. In a desperate attempt, he makes a suicide dive. #WWETLC 2012 vs. #WWETLC 2018. AJ rolls Bryan up and Daniel reverses for a three-count! Daniel Bryan beats AJ Styles to retain his WWE Championship. Valiant effort by the challenger but today fate was on the side of Bryan. So much disappointment for him. Bryan's title reign continues. AJ Styles has locked in the calfcrusher right in the middle of the ring. Twice Bryan tries to get to the ropes and twice he fails. Will Bryan tap? No he somehows rolls Styles over and survives. Up Next: Daniel Bryan defends his WWE Championship vs AJ Styles. Just as the bell rings Bryan moves out of the ring and tries to get into the head of Styles. Nia Jax starting to keep Rousey grounded. But the Baddest Woman wants to change the momentum and leaps from the top rope with a flying crossbody! Up Next: Nia Jax flanked by Tamina takes on Ronday Rousey for Raw Women's Championship match. Nia Jax using her size to her advantage straightway. Orton's head bounces of the steel chair and Mysterio rolls him over for a three count. The King of 619 wins! He is no a longer a victim of Orton. The Viper is beside himself. The match starts and immediately the action shifts outside the ring. Chairs are flying around and Mysterio lands a dropkick on Orton who falls outside the ring. Mysterio then uses the chair like a sled and slides with it to hit a splash outside the ring. WOW! Next Up: Rey Mysterio vs Randy Orton in a chairs match! This one will get brutal! Over the last few weeks, Orton has been targetting the 619. His attacks have been vicious. Will Mysterio have his revenge tonight? Dolph Ziggler with a superkick to Drew McIntyre. The referee didn't see it! The distraction helps Finn Balor hit the Coup de Grace. Finn Balor beats Drew McIntyre! Drew McIntyre versus Finn Balor: The match begins with Balor trying to get some momentum. Repeated chops from Balor can't deter McIntyre, who yells “too sweet” and stamps on his hand after slamming him to the floor. Natalya sends Ruby Riott through the table with a thunderous powerbomb from the second rope and with that she wins the match! Retribution tonight for Natalya as he picks up the win wearing her fathers iconic jacket! Ruby Riott vs. Natalya in a Tables Match is getting intense. Natalya has already tried to hit the Sharpshooter! Riott survives. But it's not long before Natalys delivers a german suplex. Baron Corbin is surrounded on all sides by Braun Strowman, Apollo Crews, Bobby Roode and Chad Gable and Kurt Angles. ultimately it is special referee Heath Slater who turns his back on Corbin and that's it! The Monster Among Men Wins despite having his hand in a sling! RAW will have a new General Manager! Celebration time inside the ring! So going by the rules of a TLC Match- anything goes. Apollo Crews, Bobby Roode and Chad Gable join to help Strowman. And just as about Corbin wants to leave the ring, Kurt Angle returns with a chair in hand. He decimates Corbin with it and the Lone Wolf has nowhere to go. ANGLE SLAM TO CORBIN! Braun Strowman has arrived in the ring with one-arm strapped. Will he take on Baron Corbin with just one hand? Sheamus hits Xavier Woods with the Brogue Kick as he was trying to get back into the ring. TheBar retains their tag-team titles. Quite a good match. The Usos vs The New Day vs The Bar: The match starts with Sheamus and Kofi in the ring for their teams. They lock up and Sheamus backs Kingston to the corner. Buddy Murphy retains after a fun match to get things started. Elias vs. Bobby Lashley now on the kickoff. Elias wins, but Lio and Lashley stand tall to get their heat. Now we move on to the SmackDown tag team title bout. 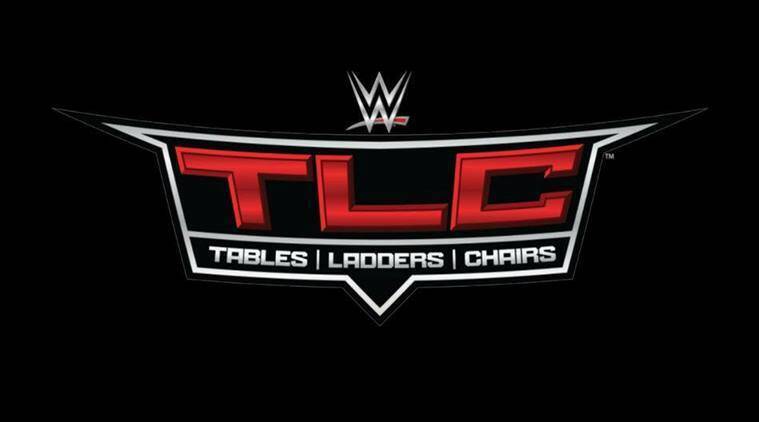 Hello and welcome to our live blog of WWE TLC- Tables Ladders and Chairs for this morning! We're starting things off with the cruiserweight title match between Buddy Murphy and Cedric Alexander. WWE TLC 2018 Highlights: Fight card for the final pay-per-view of the year.